The three-day Wurst Festival in downtown Chicago’s Daley Plaza this Wednesday through Friday (Sept. 18-20) will feature the key ingredients of any good Oktoberfest: tasty grilled sausages and ample amounts of hearty fall seasonal beers. What makes this salute to encased meats stand out from most German-style harvest festivals in the U.S. is its emphasis on responsibly and sustainably produced foods from local and regional producers. The Good Food message that comes with the brats and beer can easily be decoded from roster of the Wurst Festival’s organizers. This new entry in Chicago’s busy outdoor festival scene is a partnership of FamilyFarmed.org (whose president, Jim Slama, is a co-founder of the Good Food on Every Table website); Red Meat Market, an online retailer of sustainably produced meats; and the City of Chicago’s Farmers Market Program, which is presented by COUNTRY Financial, an insurance and financial services company based in downstate Bloomington, Ill. The menu that festival revelers will see touts “local, sustainable and naturally delicious” sausage from locally pastured and farm-raised livestock that was “raised humanely without antibiotics, hormones or steroids.” Participating providers include Red Meat Market (right, at Chicago’s Good Food Festival and Conference last March), Big Fork Brands (which makes bacon sausage), Spencer’s Jolly Posh Foods (which, not surprisingly, is British-themed), and West Loop Salumi, all located in Chicago; Big Guys Sausage from suburban Berwyn; and Gunthorp Farms, Cook’s Bison Ranch, and Miller Poultry, three Indiana farms within Chicago’s sustainable food region. The festival will feature the kind of sausages any attendee would expect to find at an Oktoberfest. The first items on the menu are a Wisconsin Beer Brat and Herman the German, “a classic Old World German bratwurst.” But there are plenty of other items that are neither traditional nor Teutonic, such as Big Guys “Bear Down” Blue Cheese and Citrus Orange, a tribute to the blue-and-orange-clad Chicago Bears football team that is described as a Greek-style Loukaniko sausage; a Hula Girl Pineapple Brat; and a Mother Chorizo, a Mexican-style bratwurst. Along with the mainly pork offerings, there will be a Bison Dog and a Miller Amish Chicken Sausage. 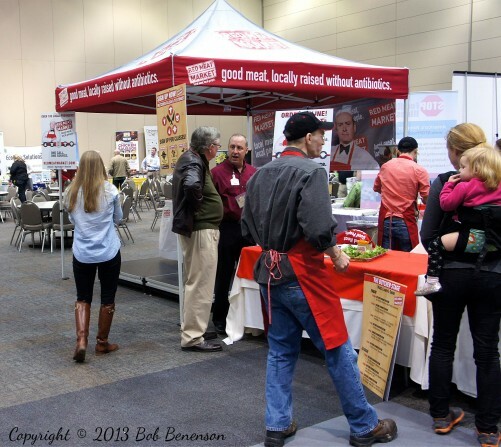 Even the accompaniments and condiments are provided by Chicago outlets that include Local Folks Food and Artizone, along with The Brinery, a maker of fermented foods such as sauerkraut and pickles in Ann Arbor, Mich. Goose Island — long the dominant craft brewer in Chicago, which has maintained that approach since its acquisition by InBev Anheuser-Busch in 2011 — is the beer provider, while Illinois Wine (formally the Illinois Grape Growers and Vintners Association) and Fox Valley Winery in Oswego at the western edge of metropolitan Chicago. There also will be musical entertainment provided by local acts on the festival stage. 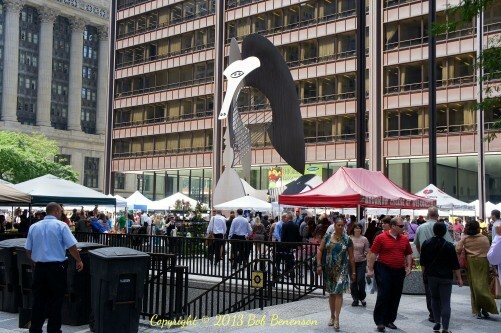 Daley Plaza, the festival locale, is in front of the Richard J. Daley government building and across the street from Chicago City Hall. It is best known for the 50-foot-tall steel sculpture by Pablo Picasso that now is one of the city’s best-known landmarks but which caused some heated debate when it was first installed in 1967. But Daley Plaza is no stranger to sustainable food, as it hosts a weekly farmers market on Thursdays from May through October. 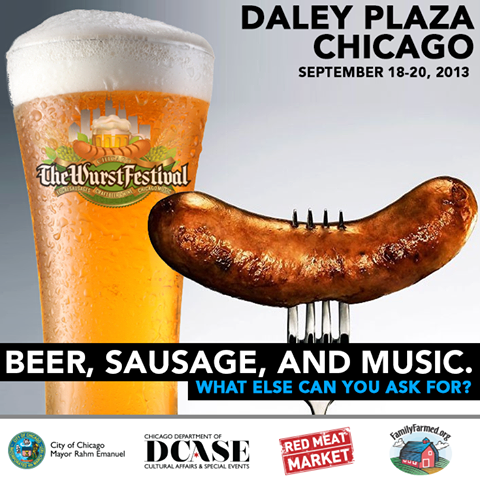 Wurst Festival Chicago will take place Wednesday, Sept. 18 through Friday, Sept. 20, 11 a.m. to 8 p.m. at Daley Plaza, located on E. Washington St. between Dearborn and Clark in the Loop. This entry was posted in Good Food Photos, Meat, Uncategorized and tagged Chicago Wurst Festival, food artisans, Good Food festivals, Good Food movement, meat, sustainable meat. Bookmark the permalink.